Info Vanessa Brown is a Community Organizer for the West Philadelphia Coalition. Before taking this position in 2006, Vanessa volunteered her services to the Coalition, organizing such activities as the annual holiday dinner and assisting with other initiatives. As a Community Organizer in the Parent Volunteers Program, Vanessa recruited parents to volunteer in their children's schools, and assisted with parent training, including developing and coordinating training on Financial Literacy. She also served as liaison between the Coalition and the school to support the school's participation in the program and resolve any problems that occurred. Vanessa's broad and varied experience as a community activist and advocate has enhanced the ability of West Philadelphia Community Based Organizations to serve its constituency. She worked as the Community Outreach Specialist at a shelter for homeless women and children; led the Mothers on the Move Committee at the Philadelphia Unemployment Project, and was a representative for the National Campaign for Jobs and Income Support. Vanessa chairs the Community Policing Committee of the Weed and Seed Project. 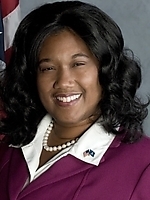 She was a candidate for the position of PA State Representative for the 190th Legislative District in 2004, and currently serves as a committeeperson in her community. With a teenage son in high school, Vanessa is actively involved in education issues, both in his school and in the school district. An advocate for self-improvement and empowerment, she is currently enrolled at Community College of Philadelphia and a participant in the New Choices New Options Program.